The sharpness of my own table saw went bad and I purchased it for exchange. Sharpness is very good and soft material is satisfied also without burr. This review is about item#9138867. Pana 's power cutter is a 135 mm blade, but I bought this 140 mm blade whether it can cut a little more by cutting rafters and so on a little more. Although it interferes with the slide cover, once it is turned once, a groove is formed in the slide cover part and it can be used normally (self-responsibility) The cutting of the rafter became smooth and usability improved. This review is about item#9138718. As the blade is thin and the section is beautifully cut spat, as expected. This review is about item#9140285. 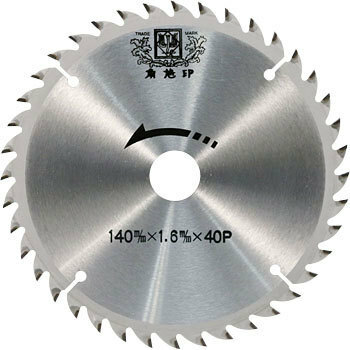 Even in the home center, we did not have this large diameter chip saw, It was saved by being able to purchase at a low price with Monotaro. The manufacturer was the first time, Sharpness was very smooth as we chose 50P for vertical cutting and cross cutting. This time I needed it, I bought it cheaply. This review is about item#09140556. I am using a do-it-yourself carpenter and sowing. Although I use it only occasionally, I am using it with satisfactory sharpness. This review is about item#9140434.